China and Japan in Latin America: What Competition? Theodore Kahn on why China and Japan are not really competing in Latin America—yet. Shinto Abe left Brazil Sunday after a tour of Latin America that brought the Japanese prime minister to five countries in ten days. Abe’s visit directly followed Chinese premier Xi Jinping’s two-week, four-country tour of the region. The back-to-back visits occasioned an inevitable stream of commentary suggesting the two Asian heavyweights were competing for influence in the region. This interpretation is wrong. Look just a little more closely, and it becomes clear that China’s presence and interests in the region are of a distinctly different nature than Japan’s. For starters, Abe and Xi visited a different set of countries. A quick glimpse of the two leaders’ itineraries goes a long way towards explaining why Japan and China are not competing head-to-head in Latin America. Xi visited Brazil, Argentina, Venezuela, and Cuba, reflecting China’s closer ties with countries that have limited access to international capital markets (Argentina, Cuba, and Venezuela) or have opposed US influence in the region (Argentina, Cuba, Venezuela, and well, Brazil). 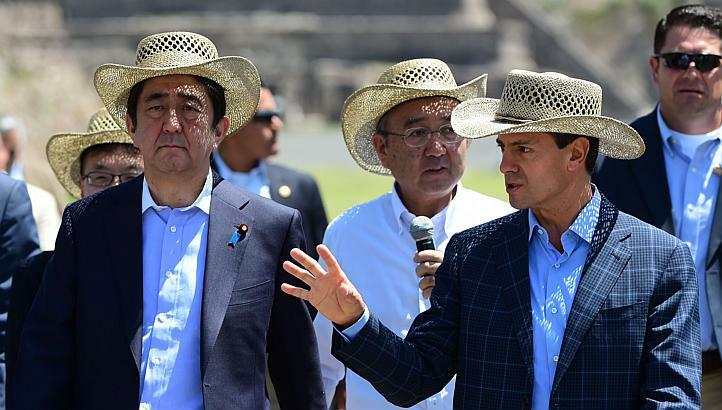 Abe, meanwhile, stayed mostly on the other side of Latin America’s geopolitical divide. The Japanese leader dropped in on the presidents of Mexico, Trinidad and Tobago, Colombia, Chile, and Brazil. Three of these countries—Mexico, Colombia, and Chile—are staunch US allies with open economies and a network of free trade agreements spanning the globe. As readers of this blog will know, these three nations, along with Peru, form the Pacific Alliance, an initiative that aims to deepen integration in accordance with a rules-based global trading system. Chile and Mexico are also participating along with Japan in the Trans-Pacific Partnership. In Trinidad, the Japanese Prime Minister met with several leaders of the CARICOM bloc, a group of Caribbean nations with close ties to the United States. Even in Brazil, where the two leaders overlapped, they offered different deals to Latin America’s largest economy. Not surprisingly, both Abe and Xi found time for the region’s biggest economy and most important diplomatic actor. But the nature of the deals discussed and signed reflects important differences in the countries’ way of conducting business with the region. China, as has been its practice throughout Latin America, threw around big headlines numbers—a US$ 5 billion credit line for Brazilian mining company Vale, for example—and promises of grand projects such as transmission lines from the Belo Horizonte mega dam and new railways linking the agricultural heartland to Brazil’s major ports. These deals generally involve state-owned entities on the Chinese side, such as the China ExIm Bank and State Grid Corporation of China and will therefore require extensive government-to-government negotiations before they see the light of day. This has been China’s preferred modus operandi in Latin America. It is not a coincidence that the countries receiving the most financing from China are also those where the government plays the biggest role in the economy. The Japanese, meanwhile, offered Brazil smaller amounts—US$ 500 million for Petrobras to build deep-water platforms, $200 million to upgrade marketing infrastructure for soy and corn sectors. However, the parties to these deals are Japanese private sector banks such as Sumitomo Mitsui and Mizuho with long histories of financing investments projects for Japanese firms in the region. The Japanese public sector has of course played a major role in the country’s economic relations. But it activities have often taken the form of cooperation projects to help firms in the region develop export potential and develop capacities to supply Japanese investors. In fact, Japan has been behind some of the region’s trademark export success stories, such as Chilean salmon and Brazilian soy beans, and helped develop local supply chains in Mexico’s auto sector. Still, if China is offering billions of dollars of financing to upgrade Latin America’s deficient infrastructure, why aren’t countries like Chile, Colombia, Mexico, and Peru also lining up? For one, these countries have access to financing on better terms from capital markets. As it turns out, China’s brand of so-called South-South cooperation, which has often taken the form of natural-resource backed loans, do not generally ensure the best terms for countries in the region. Not coincidentally, it is precisely those countries with restricted access to international capital markets—Argentina, Ecuador, Venezuela—that availed themselves of Chinese loans. More importantly still, many highly trumpeted Chinese projects in the region have failed to materialize. This brings us to the final difference between China and Japan. If history is a guide, the Japanese deals are more likely to actually happen. Last month was not the first time a Chinese leader has promised billions upon billions of investment dollars for much-needed infrastructure projects in the Latin America. This has been the norm since Hu Jintao’s 2004 tour of the region, where he promised US$ 100 billion over the coming decade. That visit, which symbolically marked China’s arrival on the Latin American scene, generated great expectations that Chinese largesse would underwrite the region’s longstanding infrastructure deficits and provide an alternative to panicky international capital markets. That decade has now come and gone, and those expectations have largely been disappointed. Most of the agreements signed between China and the region and trumpeted loudly in the press during high-profile state visits have amounted to much ado about next to nothing. Signing an MoU to invest billions in a major infrastructure project is easy; actually doing the project is quite a different matter. Latin America has learned this lesson all too well in its dealings with China. The list of proposed Chinese projects that have failed to materialize is long, amounting to a lot of promised money left on the table. The reasons for these failures are numerous, and in some cases the blame lies on the Latin American side. But a lot of the disappointment stems from China’s preference for state-to-state negotiations to define the terms of its deals. 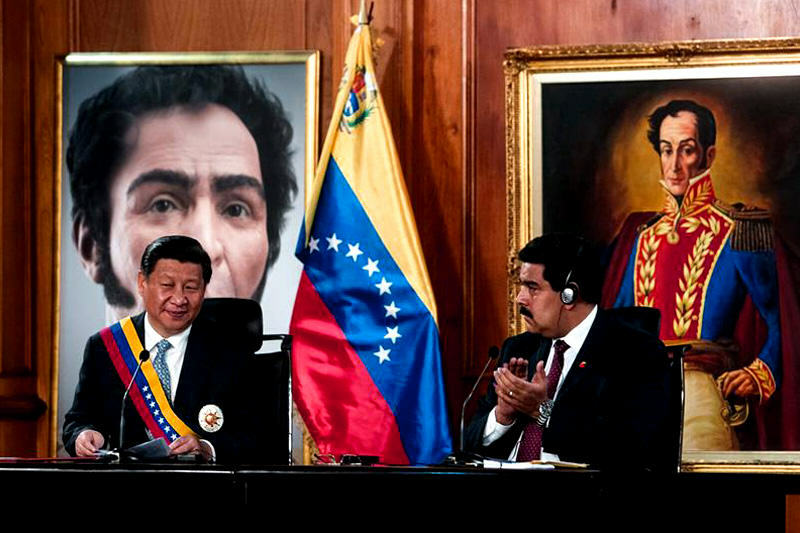 The result is that political concerns and frictions between governments—the Chinese have not always shows a nuanced understanding of the political context in their Latin American partners—end up torpedoing projects. The upshot of all this is that actual Chinese investment in the region has been tiny. 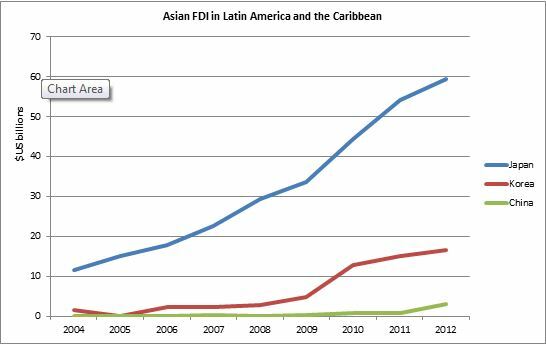 Despite the hype, official statistics from China’s Ministry of Commerce show FDI in Latin America has been a measly US$5.7 billion since 2006. Of course, that figure does not include financing from state lenders such as China’s Export-Import Bank and the China Development Bank. But as discussed, those loans have only been of interest to a handful of countries in the region that have few other options. They have also been limited mainly to natural resource sectors. Japan, by contrast, has a much better track record of actually delivering. Japanese FDI in Latin America reached US$ 60 billion in 2012—more than 10 times the Chinese figure—and accounting for over 5 percent of the region’s total inflows between 2008 and 2012. Importantly, Japanese FDI has been far more diversified both in terms of sectors and destination countries. While China’s investment has gone overwhelmingly to natural resource sectors, Japanese FDI is evenly split among the manufacturing, services, and primary sectors, meaning Japanese firms are creating jobs and bringing new technologies in areas like electric cars in Mexico and IT in Brazil. So while the narrative of China and Japan locked in a battle for Latin America’s riches might make for good headlines, it is largely wrong. The two have focused on different countries and different sectors in Latin America, and their way of doing business in the region is qualitatively distinct. It would actually be good news for the region if there were more direct competition between the Asian giants in the future—assuming it reflected a diversification of Chinese investment and financial flows. The reality is that China has, to date, benefitted greatly from the need of resource-rich yet investor-shunned countries such as Venezuela, Ecuador, and Argentina for alternative sources of financing. But close ties with these volatile governments present risks, and there are indications that China is rethinking its mode of engagement in the region. Latin America-China relations will certainly change as the relationships mature; but these changes do not necessarily mean an inexorable march to ever-greater Chinese influence. This entry was posted in Uncategorized and tagged Asian FDI, China, FDI, Japan, Latin America, Shinto Abe, Xi Jinping. Bookmark the permalink.